T. S. Poetry Press, 9780989854221, 120pp. How to read a poem. A lot of books want to teach you just that. How is this one different? Think of it less as an instructional book and more as an invitation. 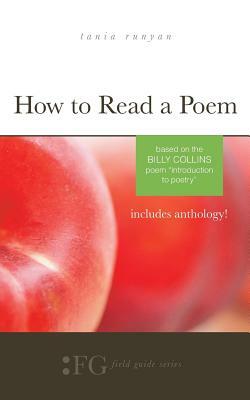 For the reader new to poetry, this guide will open your senses to the combined craft and magic known as "poems." For the well versed, if you will, this book might make you fall in love again. How to Read a Poem uses images like the mouse, the hive, the switch (from the Billy Collins poem "Introduction to Poetry")-to guide readers into new ways of understanding poems. Excellent teaching tool. Anthology included. Tania Runyan is an editor for Every Day Poems and the author of four books of poetry, including A Thousand Vessels and Simple Weight. Her poems have appeared in many publications, including Poetry, Atlanta Review, Nimrod, and Southern Poetry Review. She received an NEA Literature fellowship in 2011.